...from Notre Dame. 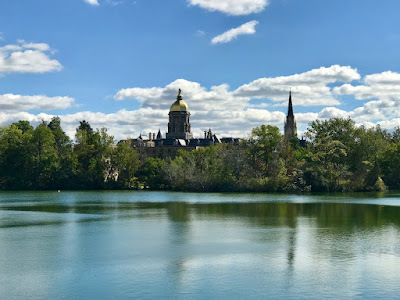 Here's a different view of the Main Building and the Basilica from the north side of St. Joseph's Lake. As leaves continue changing color and colder temps become more the norm, this tranquil view of Notre Dame taken last month reminds us that summer has come and gone. Indeed, summer is in the rear view mirror! Still, it never hurts to reminiscence just a bit. Enjoy your Sunday wherever you may be!